Human impacts along rivers through agriculture, commercial and industrial facilities, residential development and transportation infrastructure have destroyed or degraded habitat for both aquatic and terrestrial species. In Vermont, river valleys have been the focus of development and agriculture. This has lead to the loss of riparian buffers has negatively impacted many animals. You can read about the Friends efforts to restore streamside vegetation elsewhere on our website. The Friends work in reducing storm water runoff helps to improve habitat. The Friends also work on the management and control of invasive species, both aquatic and streamside, that crowd out native species and degrade habitat. 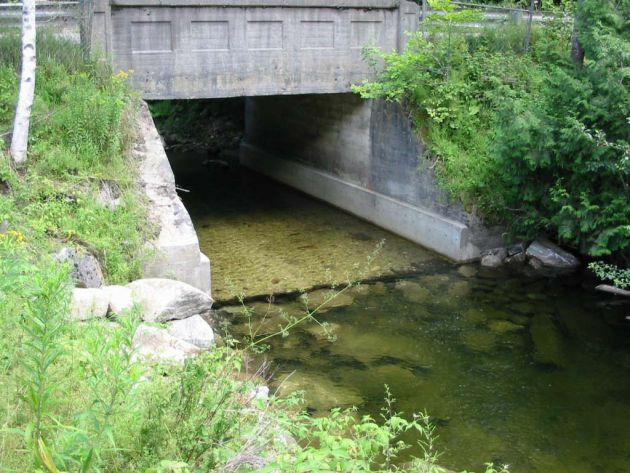 Transportation infrastructure, particularly bridges and culverts, often create significant barrier for fish and other aquatic organisms. This leads to habitat fragmentation and isolated populations. The Friends work with the US Fish and Wildlife Service and the VT Fish and Wildlife Department to fix or replace these structures. The Great Brook project, described below, is one example. 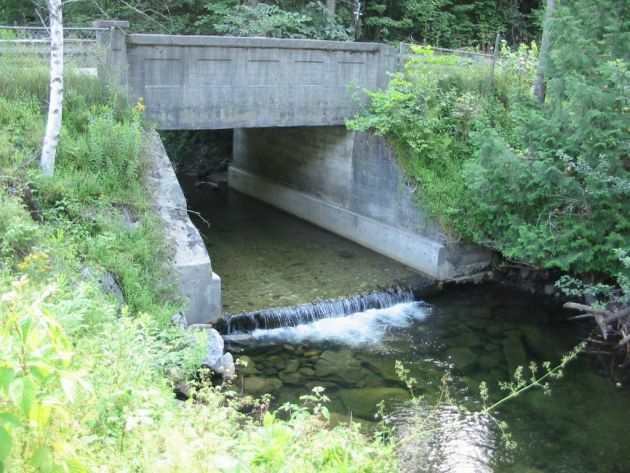 In 2010, the Friends through the Headwaters Partnership worked with the Town of Plainfield, the US Fish and Wildlife Service, the Vermont Department of Fish and Wildlife and the River Management Program to restore fish and aquatic organism passage through three culverts on Great Brook. In the first photo, you see the culvert before any work was done. The culvert poses three problems if you are fish. First, you have to make that jump up into it. If you are an adult rainbow, maybe. If you are juvenile brook trout, forget it! Let's say you are an adult rainbow and you made the jump. In low flow such as in this photo, the water is not deep enough for you to make it through. Another problem if you are a smaller fish that somehow made the jump, the current is very fast. Also there are no rocks to hide behind and take a rest. So odds are, you end up back in the pool below the culvert. In this case, fixing these problems involved mimicking nature through the installation of a rock weir just downstream of the culvert. 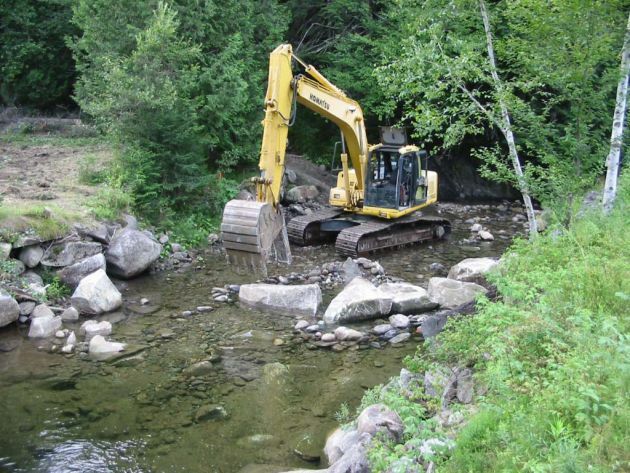 In the next two photos, you see the excavator in action placing the rock in the stream and the end result. The photo to the left shows the culvert after the weir has been completed. If you were a fish, wouldn't this make your life easier?